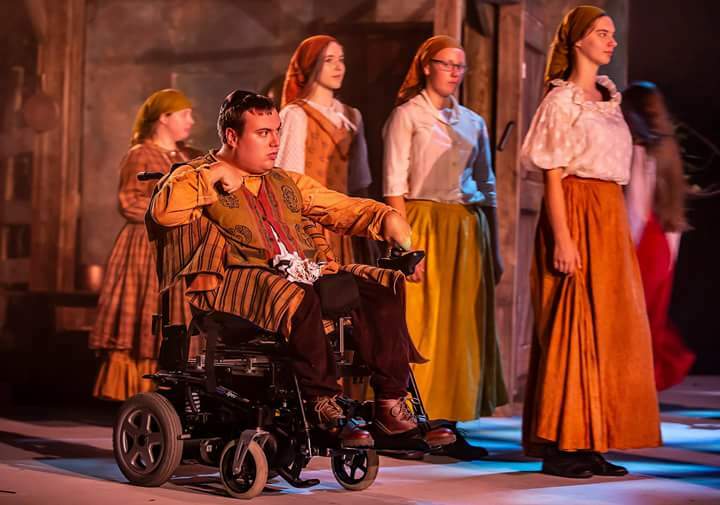 Review: Fiddler On The Roof. 5 stars! Curve Young Company and Community production. – East Midlands Theatre. 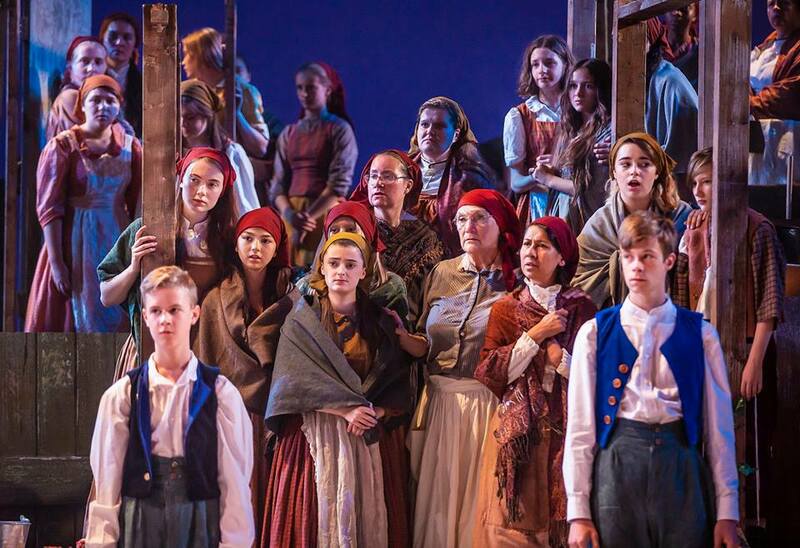 Review: Fiddler On The Roof. 5 stars! Curve Young Company and Community production. Fiddler On The Roof has a lasting legacy in being one of the most frequently produced musicals in the world. It has been mounted more than 1,300 times in Japan alone and played in many parts of the world that have never even seen a Broadway musical. It was the first show to run for more than 3000 performances on Broadway. It has won nine Tony awards and productions have been seen in North and South America, Europe, Africa, Australia, the Middle East and Asia. 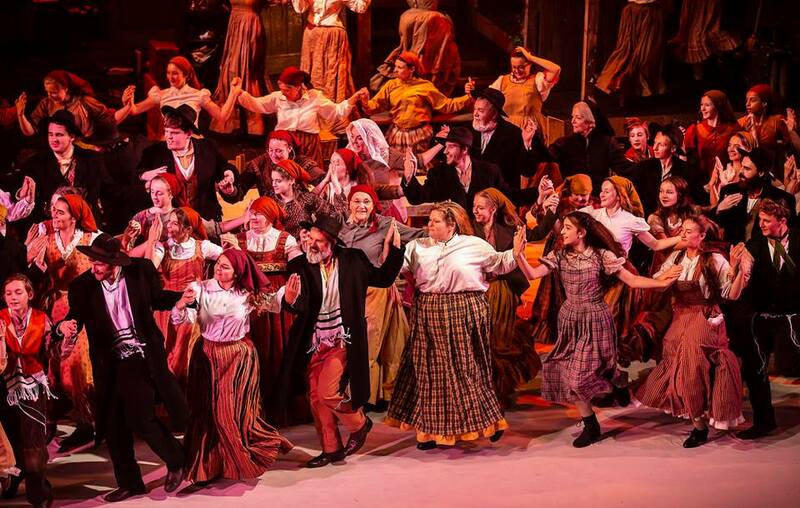 It remains as popular as ever for its striking music and the endearing story of Tevye and Golde and their growing daughters. On a darker side it deals with pogroms and sudden expulsions of communities from what they consider to be their homeland. 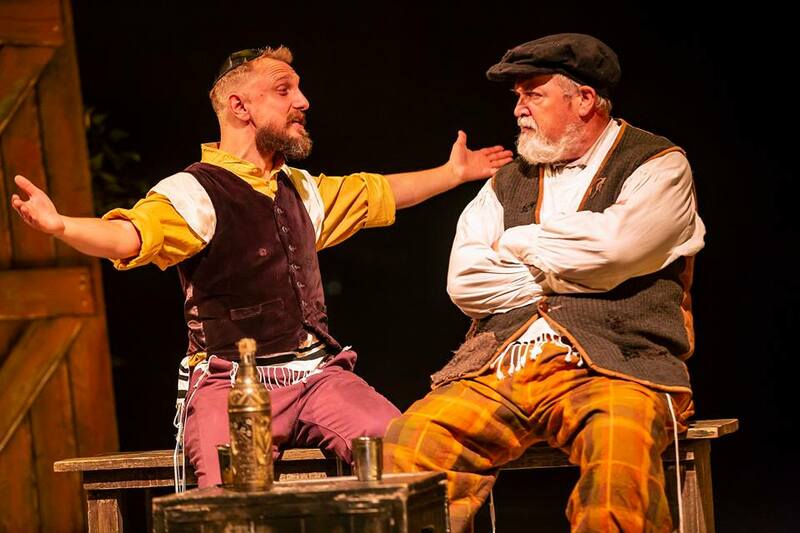 Fiddler principally focusses on Tevye’s deeply considered willingness to slowly accept great change in his money poor but, family & tradition rich, Jewish community’s life. The deep questions of ‘home’ and ‘love’ saturate this great musical drama throughout and continue to have a hold on you as you leave the theatre, much richer for the experience. You may ask why do people like it so much? It is because, like in any great story, the audience recognise themselves in the heart warming and very difficult situations albeit that they are one step removed. Great humour threads itself throughout this epic tale. At its heart it is about true love and the threat and actuality of a forced removal of a deeply entrenched Jewish culture from their home in the Imperial Russia based Pale of Settlement. Crucially it concerns the impact of, and how they deal with, that enormous social change. Sadly today we see much of refugee and immigrant lives reflected in our contemporary society and in our media. Many are escaping war and violence and intolerance but over time their cultural gifts become invaluable and our lives are all enriched for the change. But to say their experience isn’t easy would be a vast understatement. For real life refugee and immigrant stories and news about Journey’s Festival International Leicester 17 – 26 August 2018 click HERE. 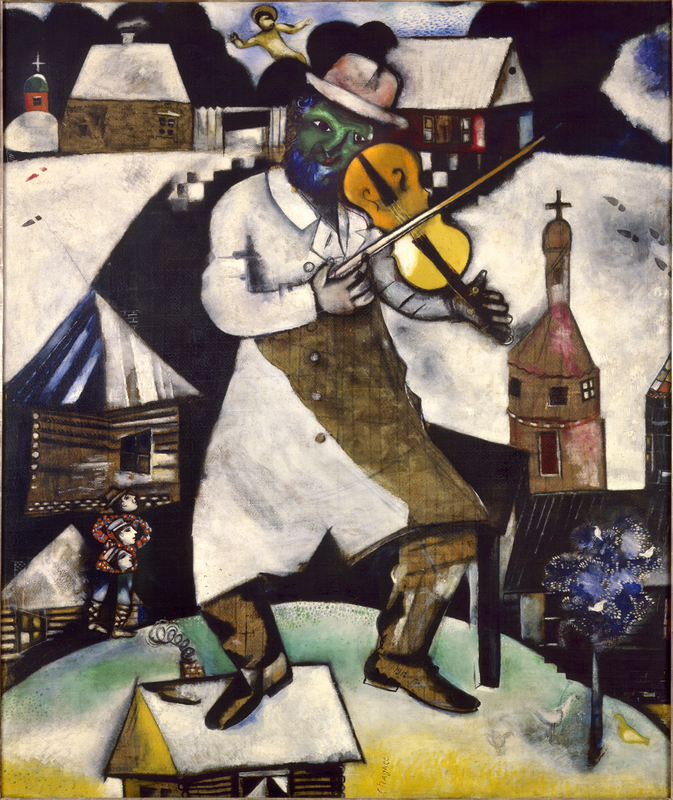 In many productions the paintings of artist Marc Chagall (1887-1985) have had significant influence on the show’s design and indeed, his image of a fiddler balancing precariously on a roof gave the show its ultimate title. And so it is, in this Curve Young Company and Community production, stunningly and painstakingly directed by Sarah Ingram and designed by Al Parkinson, with over a hundred costumes designed by Edd Lindley, that Chagall’s pictures come impressively to ‘jewel like’ colourful life on stage. Parkinson’s superb set design is a clever structural take on the fragility of a place that we call our home. However temporary. Neil Foulis’ beautiful lighting design adds immensely to the theatrical palate on the Curve main stage. It is a production request that the original choreography by Jerome Robbins be kept in any production. Curve’s Head of Learning Melanie Knott has put her trust in that and it works superbly through her choreographic vision with a very large and beautifully capable cast. The total group energy is thrillingly alive. 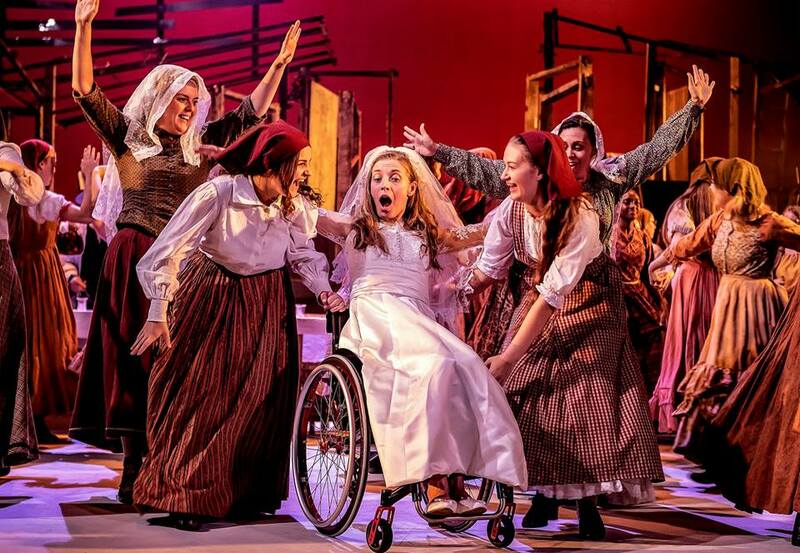 Miracle of miracles, considering that the cast are amateurs – some very inexperienced on original casting, the result is nothing short of miraculous! Overall the attention to detail en mass throughout company and chorus and certainly individually, is extremely tight. Theatrical discipline is always key and this brilliant Young Curve and Community cast certainly have it locked into all their very focussed performances. 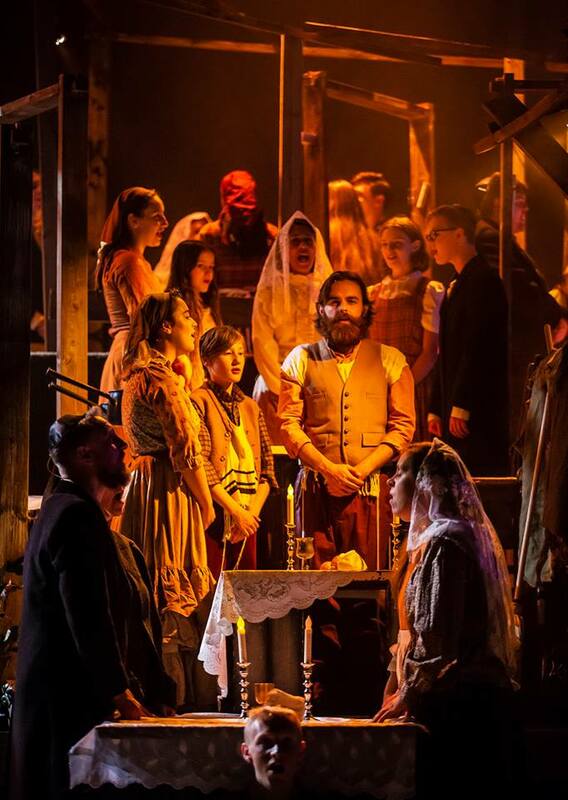 Fiddler On The Roof is chock full of well loved songs including ‘Tradition’, ‘Matchmaker Matchmaker’, ‘If I Were A Rich Man’, ‘Sabbath Prayer’, ‘To Life!’, ‘Sunrise, Sunset’, ‘Do You Love Me?’, ‘Far From The Home I Love’ and ‘Anatevka’. Especially unusual in a musical – all of them are totally hummable on the way home and beyond. Well beyond. His wife Golde is solidly portrayed by Debbie Longley. Longley puts across Golde’s more than occasional sharp tongue well but is wonderfully mellowed in the poignant song ‘Do You Love Me?’ sung with her querying and hopeful husband Tevye. This universal question expressed in a tender song has deep emotional communication and many an audience member is parasympathetic especially long term husbands and wives or partners. Lyricist Sheldon Harnick definitely tugs the heart strings with this one. 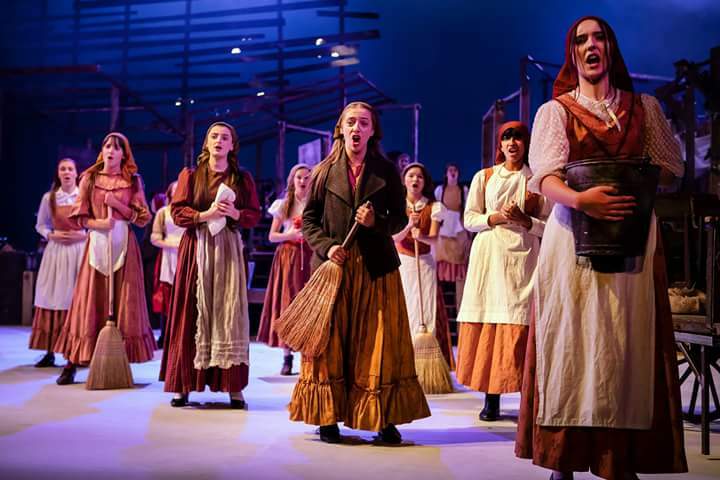 Their three older daughters Tzeitel (Lauren Russell), Hodel (Hannah Willars) and Chava (Rose Coldwell) completely charm the audience with their amusingly plea ridden song ‘Matchmaker Matchmaker’. They continue to win our hearts wholesale with their often very challenging stories of following their individual paths to true love, regardless of socio-political consequence. 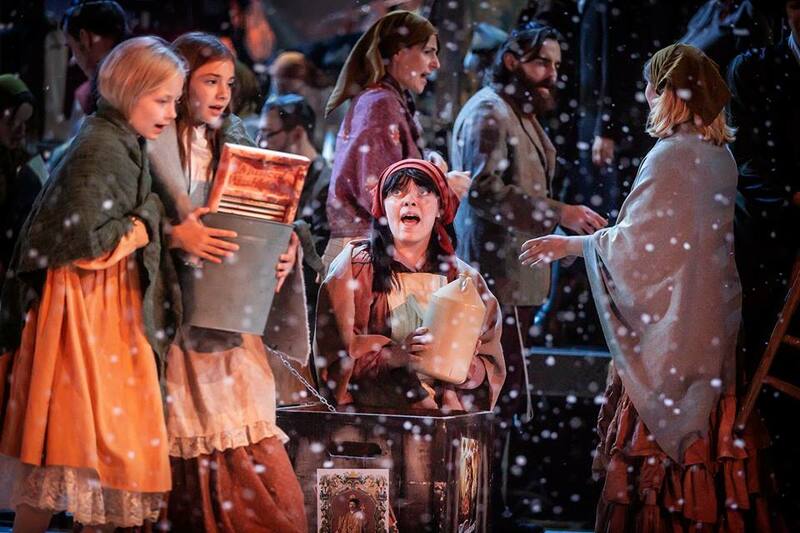 Hodel’s (Hannah Willars) rendition of ‘Far From The Home I Love’ is heart breaking. The two other daughters Shprintze (Freya Banerjee) and Bielke (Millie – Ann Penlington) make their presence known despite only a little going on in the main story for them. The true loves of Tevye’ older daughters Tzeitel, Hodel and Chava are terrifically played by three talented young men. 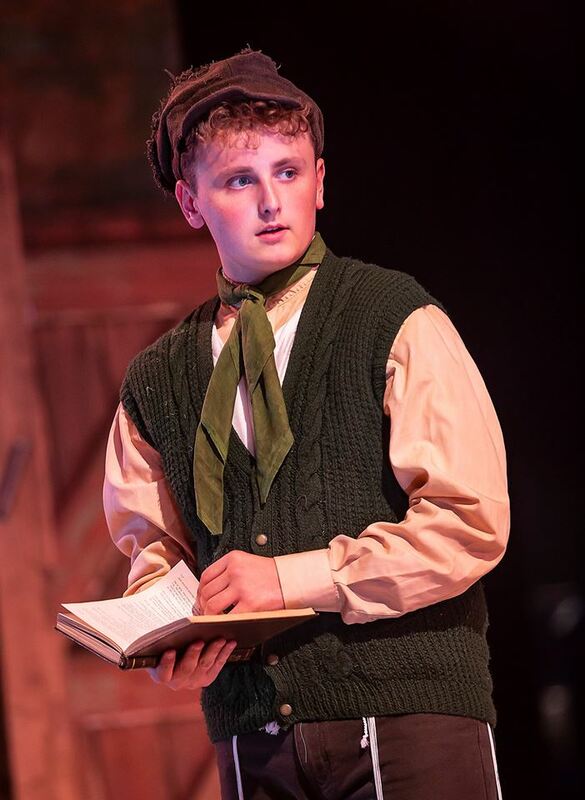 Matthew Deane is youthfully dynamic as the politically aware student Perchik; James Cottis engages us as the well meaning shy tailor Motel who impresses Tevye with his guts and small town ambitions. 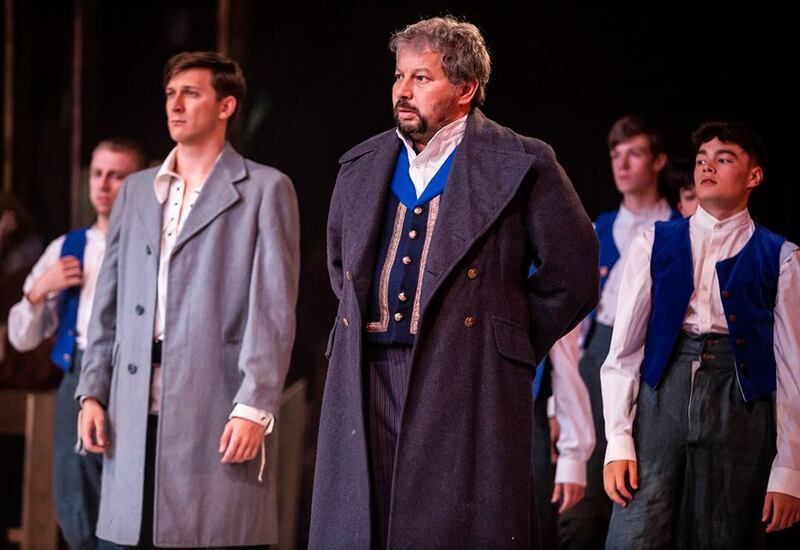 Luke Pillai convinces as the romantic young Russian Fyedka whose relationship with his daughter Chava challenges Tevye’s understanding of the world the most. All are acted out with impressive naturalism and each shows us real depth of character on their individual journeys. 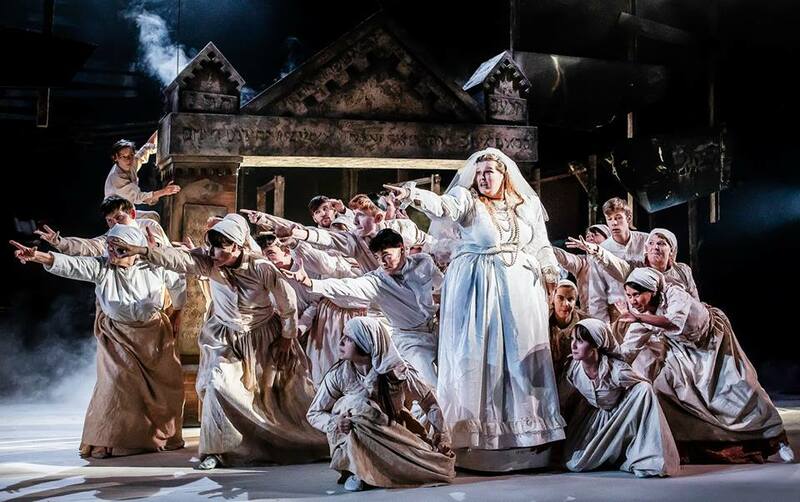 It is a large cast of over one hundred and they offer out a beautifully enigmatic group presence on stage. This gives us a definite sense of a real Jewish community through their dance, stage visuals and most especially the very moving, candle lit Sabbath Prayer section. 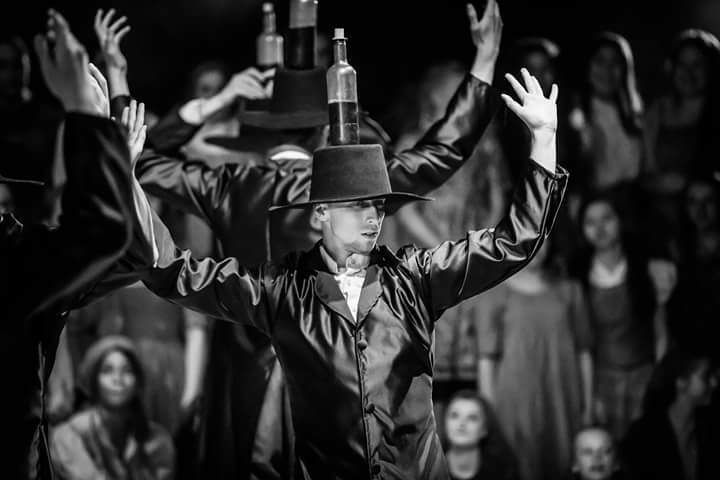 Particularly arresting is the dance work of the young Russians and the bottle dancers. 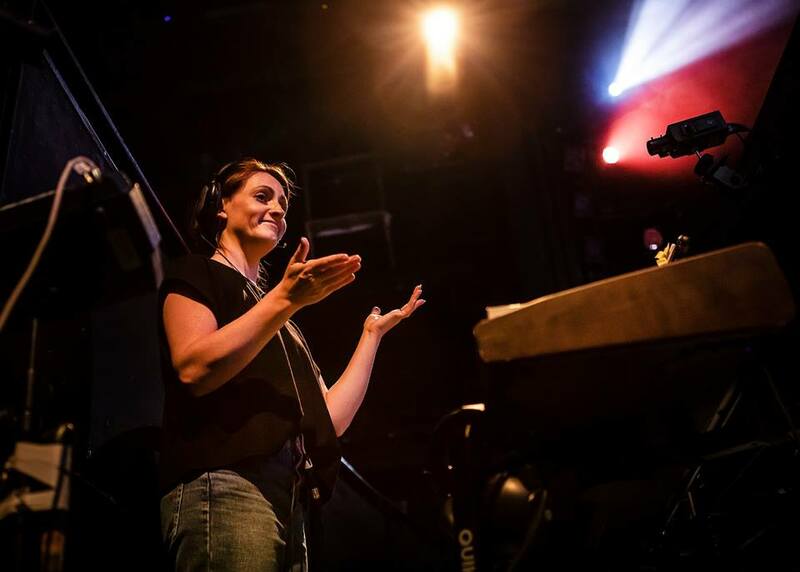 The finely tuned results are aided by the dedicated work of choreography practitioner Mel Knott and the very inclusive Sidekick Dance based in Leicester, of which Curve Theatre is a keen supporter. 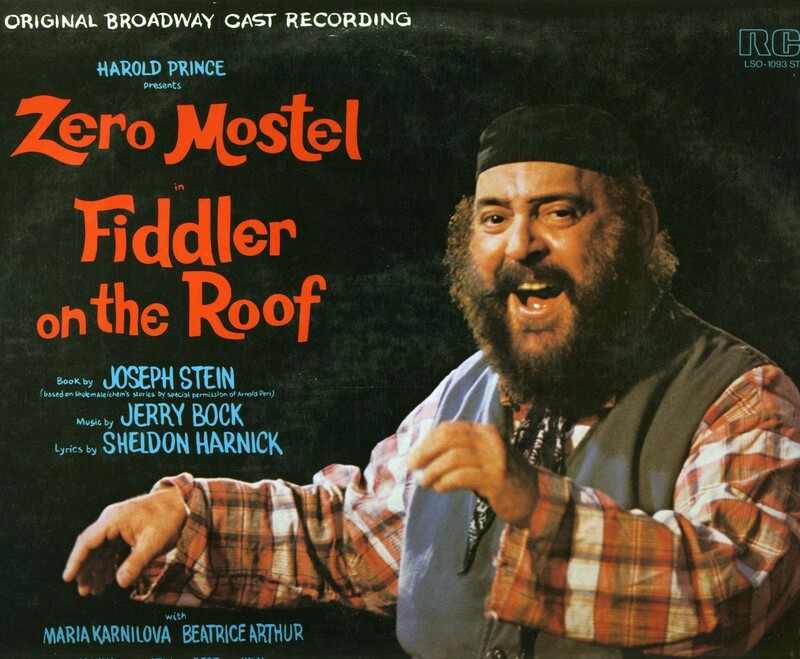 As one would expect there are a fair amount of real great characters in the story of Fiddler On The Roof. 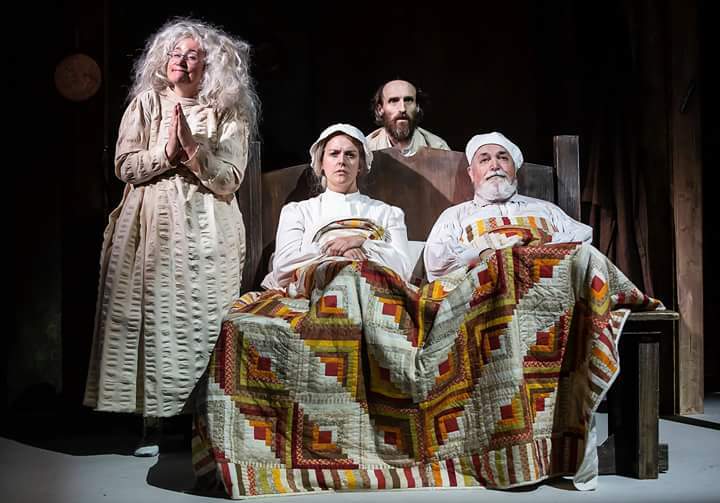 There are some stand out performances from Suzanne Barlow as Yente the garrulous Matchmaker, Ken Huggett as Lazar Wolf the lonely but wealthy Butcher and Paul Large as the witty Rabbi of Anatevka. 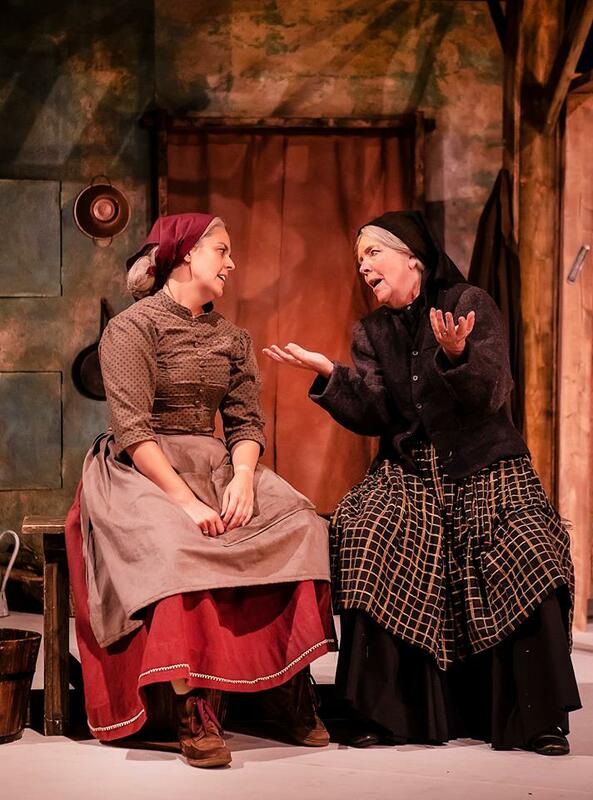 When craziness hits the fast spinning fan of the ‘Tevye’s Dream’ section Rebekah Fleming and Katy Weaver excel as Fruma-Sarah and Grandma Tzeitel both back from the dead and whooping it up on stage. A special note should be made of the very subtle but telling performance of Brandon Fletcher as Nachum the beggar. His place on stage as observer of profound change should not be under estimated. Not quite fool not quite idiot savant but more a human testament to suffering and joy and all in between. No musical is much cop without a fine band or orchestra supporting the work aurally and emotionally. Fiddler musical director Sioned Saunders and her Fiddler band are exceptional. As a community band brought together for this show they all deserve a mention. 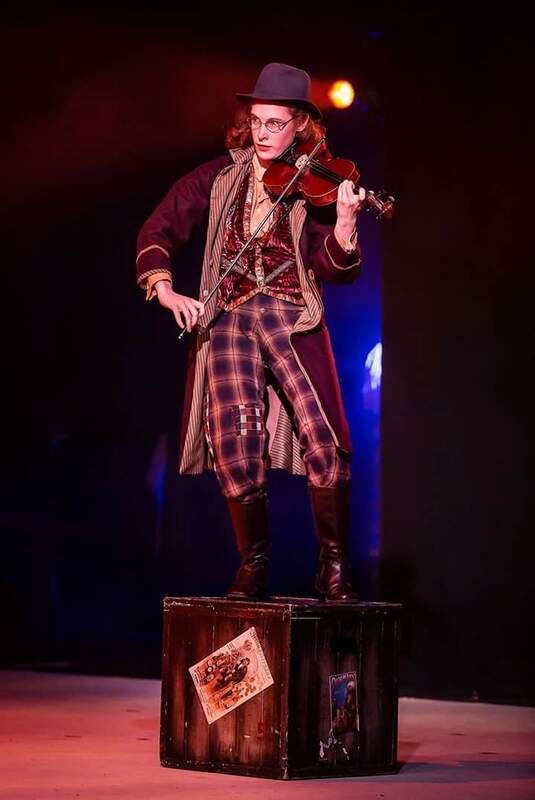 Therefore, as talented Fiddler band members we have Sunim Koria, Rachel Steadman, Zac Peachey, Tim Clamp, Olivia Needham, Alexander Bland, Peter Cornell, Josef Carter, Eleanor Page, Robyn Graham and Adam Brooks. “And then there is, of course, aside from the Rabbi, the MOST important personage in this whole production. 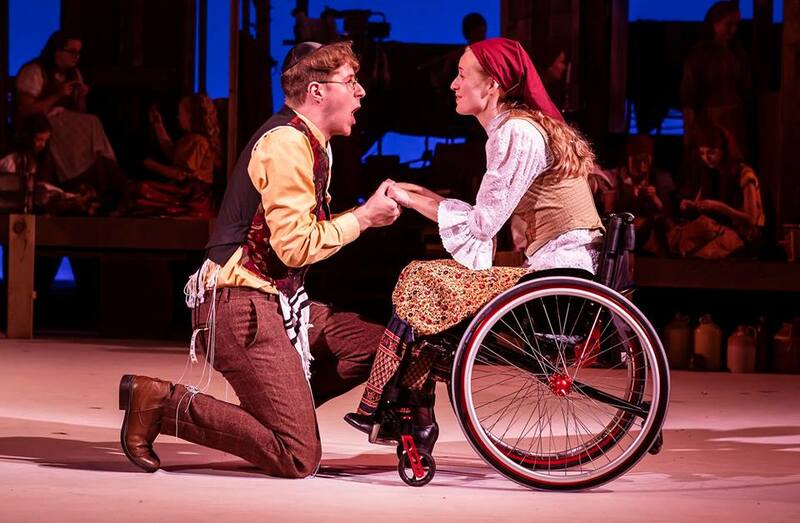 We know there is no horse for Tevye’s cart and to him a horse has great importance – so who could it be, already? Why, it is the fiddler! (Eleanor Page). Page is musical witness personified. She is always observing the action and expressing the themes and moods through her fiddle and her face and body. Beautiful work which really makes the show extra special. Fiddler production photos copyright Pamela Raith. 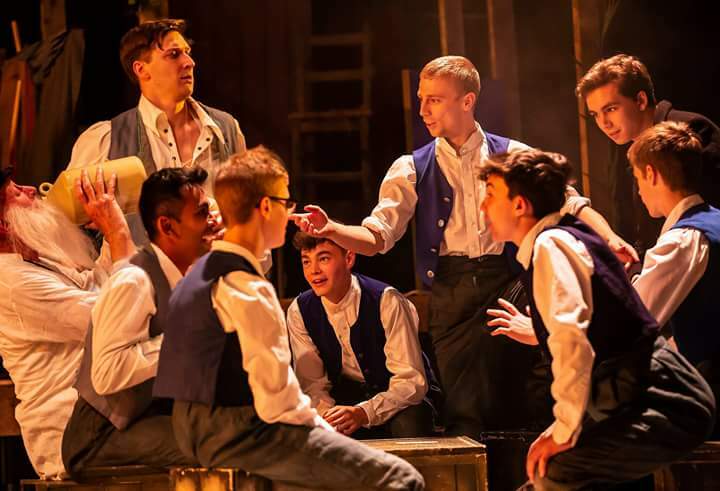 If you want to learn more about the process of the Curve Fiddler production below are links to the posts we have done to support the Curve Young Company and Community production. Curve looking for performers for the show. Fiddler On The Roof costume designs. Fiddler On The Roof in rehearsal. Fiddler On The Roof video interview with Bill Hinds (Tevye) and Hannah Willars (Hodel). We would love you to check out East Midlands Theatre Facebook and Twitter pages below. Click on images and please like and follow and share. You have captured this exquisitely! It truly is the best performance I have seen of this magnificent film/musical. Well done everyone! Thank you Heather. I love reviewing and promoting theatre especially community shows like this. It was a labour of love to review and express in my writing. I appreciate you have taken the time to praise this wonderful show and my efforts to write about it. Phil Lowe. Review: The Scarlet Pimpernel. Theatre Royal Nottingham. Promo: The Color Purple musical. Curve and Birmingham Hippodrome production.